My hometown, Los Alamos, NM, has a new Smith's grocery store that is something out of the ordinary. It is actually really well designed and good looking. 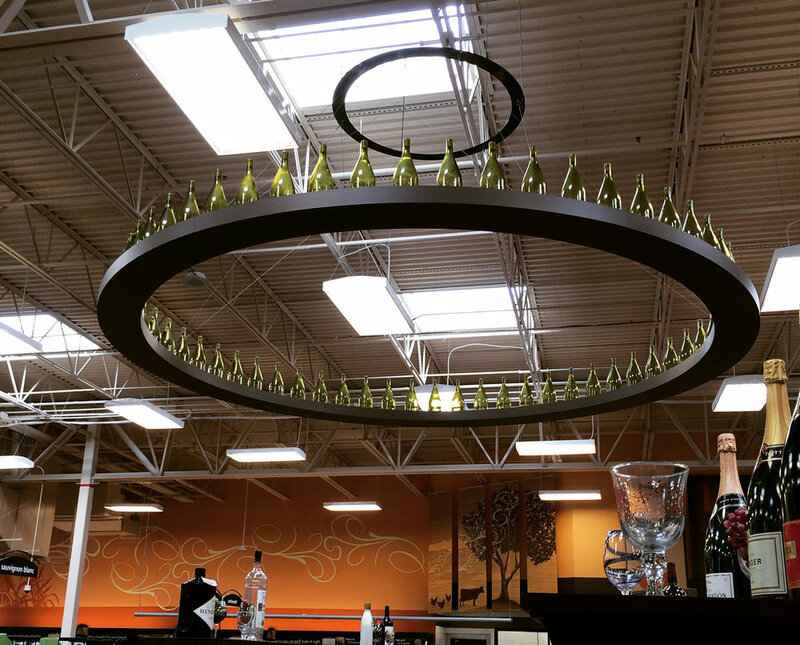 This is the oversized LED chandelier that illuminates the bar in the wine department. Of course I had to take a photo while filling my cart. This inspired me to collect all the photos I have taken lately of chandeliers made of kitchen and dining utensils, glasses, cups, saucers, bottles and more. The Ingo Maurer Campari Light , made from ten genuine Campari bottles is one of my favorite pendants. The idea - as well as the design - is charming and the light beautiful as it filters through the red liquid. The Porca Miseria is a masterpiece! This incredible centerpiece captures an explosion of broken China in mid air. Each piece is handmade to order and only limited quantities are produced. Since 2006 Ingo Maurer has made some of them with Chinese porcelain dolls. Troy Lighting has come out with some fun pieces using silverware, cups and saucers with crystals and beer bottles (complete with opener.) All made with their usual attention to detail and high quality. Buying an Ingo Maurer piece is not just just picking a light fixture. It's choosing a piece of art, an installation.